This word is wrapped in fairy dust for me, which may sound a little goofy since “pipoca” is the Portuguese word for the very non-mystical treat, popcorn. The second time (but the first time I remember) that I went to Portugal I was nine. Spending time on the island my mom is from, Terceira, was positively earth-shattering. Though admittedly, I struggled with food and proper decorum, other aspects of the trip were fascinating. Meeting my grandmother, the only grandparent I have memories of, and aunt, as well as a ton of family I had never heard of, was overwhelming. It was one of those times as a child where I was struck by the extent of my parents’ lives before me. The feeling was repeated when we went to the island my dad is from, Flores. I’d always had a sense that my parents came from another world and had two cultures and ways of knowing, but being there was powerful. 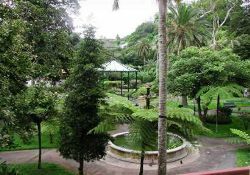 Anyway, my mom was from the “big city” on Terceira; Angra do Heroismo has a beautiful and famous public garden, known as the Jardim (or the garden, strangely enough). Entranced, walking through the gardens of this historic city, I can’t remember what happened first. Either I smelled the popcorn or I heard the pipoqueira yelling out “pi-poc-a”. I suspect it was the latter, because I remember asking what the word meant. In retrospect this seems a little strange because we spoke Portuguese at home, but I guess pipoca is one word that didn’t manage the trip over, like the word juice (sum) or knife (faca – guess why that one didn’t make the trip). Everything about this word became happiness. Not only did it sound like popping corn, and make me smile as I said it, my parents were happy that I was excited by a new word, they were happy to be there and probably also happy that I was excited about some kind of food. To top off the moment’s magic, we actually bought popcorn, which was a real treat since my parents were never really the spontaneous street food type. In sum, the word pipoca gives me a smile. It’s fun to say, especially for English speakers, and reminds me of a happy and a rare moment of being caught up in magic. Which brings us to why you love popcorn as much as you do. Awe… 🙂 Cheese.